Burglar Frank Sturgis is one of the men who attacked Pentagon Papers leaker Daniel Ellsberg (see March 1971) outside a memorial service for the late FBI Director J. Edgar Hoover in May 1972. The address book of one of the burglars contains sketches of the hotel rooms to be used by the campaign of Democratic candidate George McGovern during the Democratic National Convention in Miami. A Miami architect says that burglar Bernard Barker tried to obtain blueprints of the Miami convention hall and its air-conditioning system. 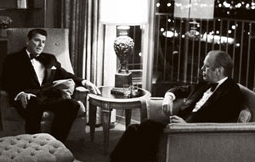 Burglar E. Howard Hunt’s boss at the public relations firm he works for (see June 17, 1972), Robert Bennett, has organized over 100 dummy campaign committees that have been used to funnel millions of dollars into the Nixon re-election campaign. 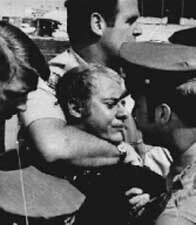 Burglar James McCord (see 2:30 a.m.June 17, 1972) was carrying an application for college press credentials for the Democratic convention when he was arrested. New York Times headline announcing Nixon victory. [Source: New York Times]Richard Nixon defeats Democratic presidential candidate George McGovern in the largest landslide in modern electoral history. Nixon wins over 60 percent of the votes and 49 of the 50 states. [Gerald R. Ford Library and Museum, 7/3/2007] Democrats retain control of the House and Senate. Nixon’s victory breaches traditional Democratic strongholds in the Northeast, and his “Southern strategy” creates a “Solid South” of Republican support. Harry Dent, a White House aide involved in the “Southern strategy” of targeting conservative Democrats who once supported segregationist candidate George Wallace (see May 15, 1972), says, “[T]he Southern strategy is working—in fact, it’s working all over the country.” Democrats, on the other hard, were sharply divided throughout the campaign, with many traditional Democratically aligned organizations such as trade unions refusing to back the McGovern candidacy, problems with finding and keeping a suitable vice-presidential running mate, and McGovern surviving a challenge to his primary victory at the Democratic convention. [Washington Post, 11/8/1972] The simmering Watergate investigations apparently have little drag on the Nixon re-election efforts.